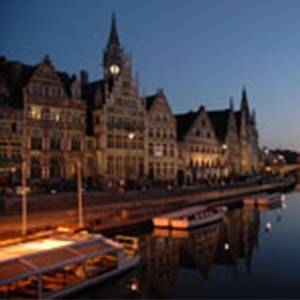 Gent is both a historical and modern city with a population of 258,000. The modern daily life of its inhabitants takes place in a splendid setting. The city of Gent breathes, lives, works and has fun day after day. Its University, also known as UG, is the sister university of the University of Liège (ULg), founded in 1817 (a complete university). You can discover its many museums (of design, modern art, etc. ), its churches and cathedral (of Saint Bavon which houses the work of the Van Eyck brothers "The Adoration of the Mystic Lamb"), the Gent Festival (Gentse Feesten) and the "Odegand" festival. A couple taste the peaceful atmosphere Beguine convent. Parents and their children stroll through the pedestrian streets of the city centre. A tourist takes a photograph of the three towers, an action so often repeated for a result that is always slightly different. A businessman iPhone in hand walks down the magnificent Quai aux Herbes, crosses the Lys and enters his elegant four star hotel, tucked away behind a medieval façade. Dozens of terraces invite passers-by to discover the specialities of Gent. The sun reflects of the omnipresent water. The city comes alive and bids you welcome.